I have an article published today at Unruly PaperArts where I look at what elements we might include in our artistic projects to make it part of the Shabby Chic genre? What would you say these were? 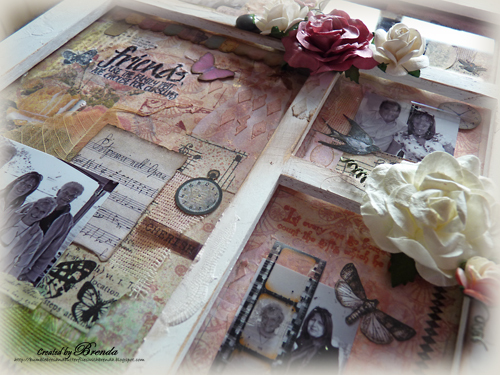 Shabby Chic in room decoration and as a form of interior design is well documented, but what about a canvas, a card, an altered box? What do we choose to use to get this style? Please hop on over to UPA today to see what I think it means for us crafters. Have a fabulous weekend. I will be at the Isle of Wight Festival when this is published and at the time of writing the weather looks unsettled, but fingers crossed. I will catch up with you next week when I get back. Do hope your weather has been better than ours, and that you're having a good time regardless... off to check out UPA! Hi Brenda, apologies for not getting over to visit earlier. Thank you so much for the lovely comment you left on my GDT post for CVC. I was terribly nervous about that post so thank you - thank you very much! I've not heard of UPA so I'm going to pop over to see what it is because I do love a bit of shabby chic style. Wow Brenda, a fascinating article, great projects to see. Congratulations on the article Brenda. Going to pop on over as soon as I finish writing this comment. Off for some good reading! Brenda, I sure hope the weather treated you kindly! Hugs! Just came over from UPA... what a great article with loads of wonderful examples!! This is so pretty! Love each dedlightful tableau!